The hot debate for and against noncompetes continues in the United States. Currently, a battle between two insurance brokerages, California-based Alliant Insurance Services Inc. and U.K.-based Aon plc, is garnering national attention. Aon P.L.C. v. Michael Heffernan et al. is bringing to light the key reasons proponents and opponents argue the validity of noncompetes, particularly for top insurance producers. Alliant hired Michael Heffernan, former executive vice president and regional managing director of Aon’s construction services group, and approximately 26 other former Aon employees. Alliant and Heffernan preemptively took action in California seeking to declare the noncompete he signed with Aon to be unenforceable under California law. California likely would not have upheld the covenant because it has a “strong public policy in favor of free market competition,” said Lisa Von Eschen, partner with Lamb and Kawaskami LLP in Los Angeles. Alliant lost momentum when the courts ruled the case would be held in Illinois, which is one of 30 states in the U.S. to maintain that noncompetes against employees are enforceable. One of Aon’s biggest concerns, however, is the potentially pawned confidential data Heffernan may have acquired. The lawsuit notes that, shortly before Heffernan resigned, he requested access to AonWrap, the company’s data management system and proprietary software. This was the first time since August 2015 that he had requested any type of data or report. Heffernan’s actions leave Aon to believe some of their proprietary information may have been shared with Alliant. Proponents of noncompetes argue that they are necessary for the protection of company secrets and confidential information, such as what Aon is concerned may have been taken by Heffernan. In a world with competitive markets, it can be tempting for employees, particularly insurance producers, to leave an agency for a better opportunity and take their clients and company information with them. 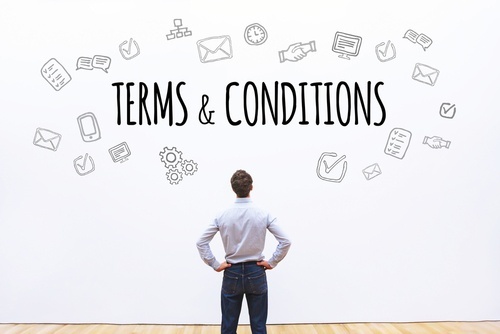 Noncompetes help protect businesses from profit loss due to such actions. On the other hand, those opposed to noncompetes stress the toll restrictive covenants can take on workers, such as reduced bargaining power, occupation abandonment, and reduced job churn, which are good for the economy. In addition, in cases like Aon where they require employees to choose between stock options and noncompete conditions, employees suffer financially. The solution may not lie in a focus on company security through restrictions, but rather security through a positive and nurturing corporate culture. Entrepreneurial or lifestyle agencies offer this solution. Entrepreneurial agencies provide top producers with better options such as equity in their book of business, stock options, flexible schedules, increased commissions, and the freedom to move should that desire arise. The solution doesn’t rest in fear of a potentially breached legal document that makes top producers feel trapped but in an agency model that compels producers to want to stay. 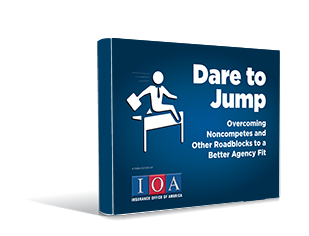 If you’re struggling to decide whether you can leave your current agency due to a noncompete or restrictive factor, download our complimentary eBook “Dare to Jump: Overcoming Noncompetes and Other Roadblocks to a Better Agency Fit.” We evaluate the benefits and costs of leaving with each of these roadblocks. We break down how restrictive covenants, financial concerns, and other factors can keep you from moving to a more secure future and what your options are to move on to that better model.